Four years after introducing the program to its passengers, Japan’s All Nippon Airways (ANA) will launch the seventeenth phase of its “Tastes of Japan” campaign, which will highlight the cuisine of three more of the country’s 47 prefectures. 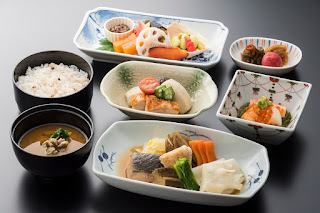 The airline launched its campaign in September 2013 to introduce regional beverages and cuisine to ANA flights, airport lounges and other venues to raise the profile of Japan’s lesser-known prefectures, particularly to overseas customers, and drive tourism to Japan. The 17th and latest phase of the project, which will run from September through November, will introduce ANA customers to products from Hyogo, Iwate and Okinawa prefectures. In November, passengers in business class on international flights will be served a lightly-smoked Tajima Sukoyaka Chicken sauté with a Kobe red wine sauce. 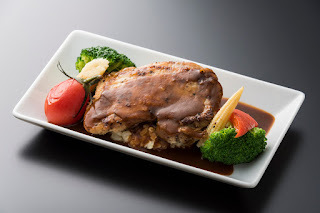 'Sukoyaka' means healthy, and Tajima Sukoyaka Chicken is a well-known brand of chicken from Hyogo Prefecture. The flavor of the chicken is complemented by the smoked flavor of the sauté. In September, at the ANA SUITE LOUNGE DINING h restaurant at Tokyo's Haneda Airport (HND), passengers boarding international flights, can enjoy Gokoku-Manju, or five-grained steamed buns, with Akashi Sea Bream accompanied by a soup made with onions from Awaji Island and mushrooms. The steamed Akashi Sea Bream wraps the bun containing five grains of black sesame, soybean, azuki bean, millet and barley. From September through November, passengers in business class on international flights can experience the local cuisine of Iwate prefecture. The served dish features the local specialty of Hittsumi, a flattened flour dumplings in a broth, served in a bowl together with locally-caught salmon and Nanbu-fu, a local variety of wheat bran. In October, the ANA SUITE LOUNGE DINING h restaurant at Haneda Airport, will serve passengers boarding international flights, "ANA Original Parfaits Iwate". The parfait includes compote made using Iwate's famous Shin-sekai, which means "New World," brand apples as well as vanilla ice cream created with milk from the local town of Kuzumaki, and caramel ice cream. 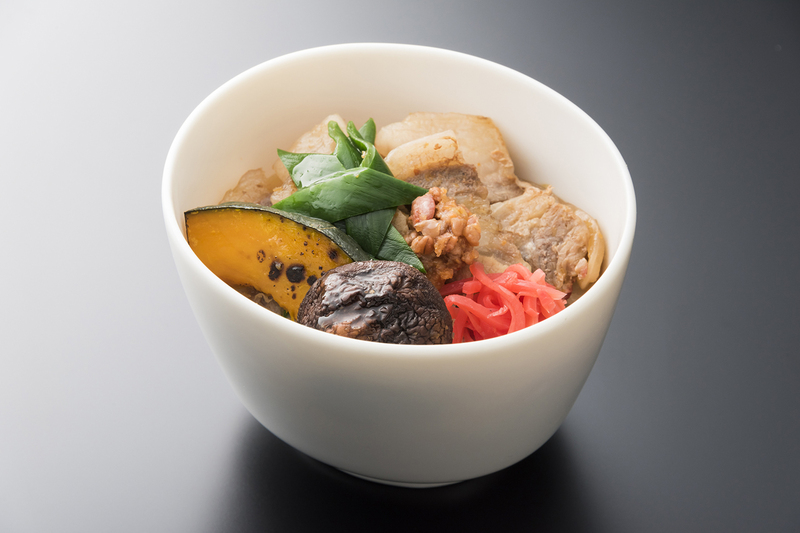 From September through November, passengers in business class on international flights will be served Agu Pork in a Moromi bowl. Agu is a high-quality brand of pork unique to Okinawa, and known for its sweet and juicy flavor. During the same period, the ANA SUITE LOUNGEs for international flights at Narita and Haneda Airports, will offer Okinawa-grown Shequasar with herb jelly. This refreshing dessert is made with herb tea featuring a mixture of seven herbs, including hibiscus, accompanied by jelly made with French honey, topped off with citrus fruit pieces including locally-harvested Shequasar. As part of the project, ANA customers are also able to sample Japanese sake, shochu and awamori, the 'Kokushu' or national spirits of Japan, at ANA airport lounges in HND, NRT and Kansai International Airport (KIX) in Osaka. More information on the featured prefectures is available on a special website dedicated to the Taste of Japan campaign.